Happy Ticket winning the Ballerina in the mud. Older female sprinters highlighted Sunday's card at Saratoga with the $250,000 Ballerina Stakes. A contentious field of seven fillies and mares went to post in this Grade 1 event at 7 furlongs, with no clear favorite in the betting. Happy Ticket was sent off as the 2-1 favorite over 3-1 My Trusty Cat and 7-2 Forest Music. Forest Music and 15-1 shot Vision of Beauty battled on the front end through a brisk quarter in 22.06 over the muddy track, with 24-1 shot Molto Vita close up in third and the favorite Happy Ticket remaining in contact in fourth. Forest Music broke free of the pack by a length and a half after 4 furlongs in 45.01. Rounding the far turn, jockey John Velazquez asked Happy Ticket for her rally and got it, as the favorite came out three wide and took the lead inside the 3/16 pole. Through the lane she drew away to a commanding 5 1/2-length win in a time of 1:24.53 over late-running 6-1 shot Pleasant Home. Molto Vita hung on for third, while Forest Music tired badly in the stretch and finished sixth. Happy Ticket in the winner's circle. Winning trainer Andrew Leggio Jr. said, "That's what we were going for - a Grade 1. I was concerned about the track because she has never run on a muddy track. When the mud starts hitting them in the face, they could stop. I was looking for a seven-furlong race because that seems like it might be her trait. We'll stretch her out when the time comes. She's already won at a distance. She is supposed to leave tomorrow at 7 o'clock. I've got all my family in New Orleans and it doesn't look good right now (threatened by Hurricane Katrina). All my kids got in the car, and they're headed to Shreveport (La. ), now; about 10 of them." 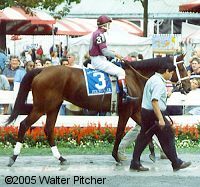 Winning jockey John Velazquez said, "I got to the paddock and asked (Leggio) why she broke poorly last time. He said, `Let me show you.' He showed me the bit she has in her mouth. He said, `You might want to give her a lot of rein from the gate.' That was it. I did what I was told. She broke perfectly and I was where I wanted to be on the backside. I called on her at the 3/8 pole, and she was going well. I couldn't have asked for a better trip." Second place finisher Pleasant Home in the paddock. Her trainer Shug McGaughey said, "I thought she ran fine. Unfortunately, we ran into the Lost in the Fog of the fillies." 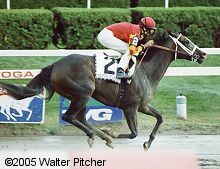 Jockey Cornelio Velasquez added, "It was a tough race for her. 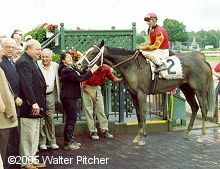 She ran against a tough filly, and I thought she ran well over this track to get second." Third place finisher Molto Vita in the paddock. 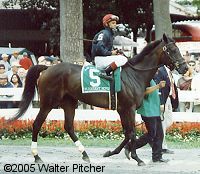 Her jockey Rafael Bejarano said, "She broke really fast and I tried to keep her in good position going around the turn. When I asked her to run at the 3/8 pole, she was coming strong, but Happy Ticket was too much for us."